One interesting aspect of the newness of digital services and accounts is that not much thought has been put into former users who are... no longer alive. Eventually, users and companies should should consider the inevitable: who will inherit your iTunes and Kindle libraries? What will happen to your Facebook page and Twitter feed? 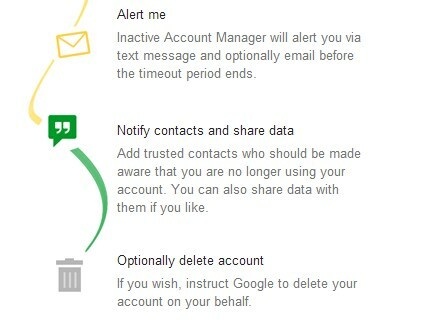 I'm not sure about those companies, but Google's got a plan with its Inactive Account Manager. Without ever mentioning death explicitly, the system offers the steps you'd want to consider, enabling you to automatically notify contacts, share data, and delete the account entirely. It's good forward thinking - because in this case, a little late is definitely too late!